The Gorkha Janmukti Morcha, caught off guard by Trilok Dewan's resignation from the party,# has decided to hold talks with leaders to ensure there are no more desertions. The party will also hold public meetings in Kalimpong on September 30 and in Darjeeling in October so that party cadres are not demoralised. The first meeting is being held in Kalimpong as Harka Bahadur Chhetri, one of the two MLAs to quit the party, is a legislator from there. Following Dewan's resignation today, the Morcha sources said more public meetings and interactions among the party leaders was required. "But the decision has not been finalised as Bimal Gurung left for Illam district in Nepal early this morning for puja. Gurung is expected to return on September 24. The strategy is likely to be finalised after Gurung returns," said a party source. "While we cannot forcibly keep anyone in the party, we have to ensure that there is no major exodus of other leaders who share similar feelings as Chhetri and Dewan. More interactions among the party leaders seem to be the need of the hour," said a source. While a section of the Morcha leadership is of the opinion that Trinamul is manipulating a revolt in the hill party, a large section of the Morcha leadership is confident that Chhetri and Dewan will not join Trinamul. "Mass acceptance of Trinamul is still a remote possibility in the hills," said a Morcha leader. 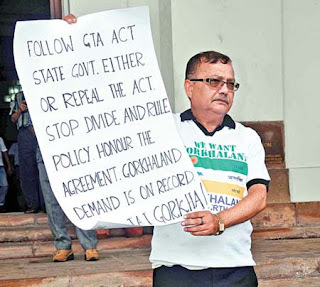 The Morcha's main grouse against the state government is its alleged "interference" in the functioning of the Gorkhaland Territorial Administration (GTA). Even though Trinamul has made inroads into the hills, the Morcha feels some people are attending Trinamul meetings only for development boards that the state government has announced for various hill communities. "We still believe though development boards have been created for different communities, the people will unite for the larger cause of our identity and Gorkhaland," said a Morcha leader. According to Trinamul sources, the ruling party is trying to stoke dissent within a section of the Morcha, especially among leaders who are unhappy with the alleged "dictatorial" attitude of Gurung. "Didi is trying to take advantage of some Morcha leaders' disenchantment with the style of functioning of Gurung and win them over. Her target is the educated section of the hill population, which is not happy with the confrontational attitude of Morcha leaders," said a Trinamul source. Both Chhetri and Dewan had cited their unhappiness with the leadership's style of functioning for resigning from the party. North Bengal development minister Gautam Deb, when asked if any of the two former Morcha MLAs would join Trinamul, said "both are erudite and have an excellent reputation across the hills. While Harka Bahadur Chhetri is known to be a scholarly person and is one of the best speakers in the Assembly, Trilok Dewan was the chief secretary of Andhra Pradesh and has huge administrative experience. Gorkha Janmukti Morcha is a different political party and we have nothing to say on it. But we honour the decisions which these two persons have taken," Deb said in Siliguri today. He added that given their "administrative acumen, we from the state's side will surely seek their suggestions and would wish their companionship for development of the Darjeeling hills". Some Morcha leaders said the party's decision to ask the MLAs to resign from the Assembly was part of a larger game plan. "The party has also considered the option of asking municipal councillors to resign depending on the situation to put pressure on the state government. However, the two MLAs' resignation from the Morcha has made the party rethink of its tactics," said another source. The Morcha is now pinning its hopes on its alliance with the BJP to ensure that the morale of its supporters does not flag. The party is hoping that granting tribal status to 10 hill communities and the announcement of a central university in the hills can boost the morale of its cadres. "If these issues are considered by the Centre, it would send a positive message to the hill people," said a source. The Morcha will also tell its supporters of its alliance with the BJP and that there is always hope on "some positive development" from the Centre until 2019. "The party is looking towards the Centre for some concrete decisions by 2017," said a source. The Gorkha Janmukti Morcha, caught off guard by Trilok Dewan's resignation from the party,# has decided to hold talks with leaders to ensure there are no more desertions. The party will also hold public meetings in Kalimpong on September 30 and in Darjeeling in October so that party cadres are not demoralised.